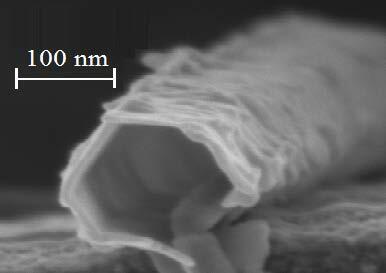 We synthesized thin nanotubes of Bi2Te3 with extremely insulating bulk at low temperatures due to disorder. Using nanotube structures, we optimized the surface to bulk volume ratio. The nanotubes were synthesized by a solution phase method. Cross sectional SEM image of the nanotube is shown on the left. Strong oscillations in electrical conductance were observed as a function of the magnetic field applied parallel to the nanotube as shown on the right panel. The period of the oscillation matches h/eπr2 , with h, e, and r being respectively the Plank’s constant, charge of the electron and r the radius of the outer surface of the nanotube. The oscillations stem from interference of the electron waves that reside on the outer surface of the nanotube. This observation demonstrates coherent quantum transport on the surface even for highly disordered samples providing a direct confirmation of the inherent topological character of the nanotube. * Collaborator from Univ. of Science and Technology, China.